Los Angeles covers more than over 34,149 square miles. The popular Los Angeles attractions are spread all over, with some of them as much as 60 miles apart. Things are getting better in the LA area in terms of public transportation, but the American love affair with the automobile was born in Los Angeles, and most people get around by car using the freeways. California's first freeway, the 6-mile Arroyo Seco Parkway (now called the Pasadena Freeway) opened in 1940. Today, more than 600 miles of asphalt has been laid in and around Los Angeles. It sounds like a lot, but in fact, the city ranks 44th among urban areas in freeway space per resident. It's no wonder that you've heard about the resulting gridlock. The roads are so busy that a simple fender-bender can make six lanes slow to a crawl for miles. 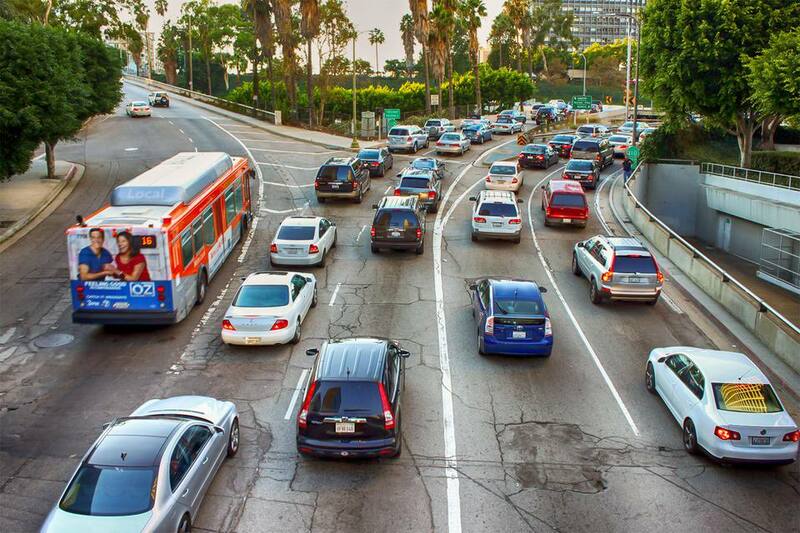 Don't let the visitor's bureau or any other happy-talking travel writer tell you that LA traffic jams don't exist. Just ask any resident and if you don't believe them, USA Today reported in 2018 that Los Angeles has the country's worst traffic, but despite having the worst overall congestion, LA has lower peak period tie-ups than San Francisco, Seattle, Boston, and Portland. And things get much better after dark, with Los Angeles city streets ranking better than 35 other cities. Los Angeles drivers are aggressive. Don't expect them to slow down to let you change lanes. And they drive fast. In fact, the de facto motto seems to be "if the freeway is open enough, go as fast as you can." You could easily be on Interstate Highway 405 driving 75 mph in the slow lane and getting passed by everything on the road. Angelenos' inability to drive in the rain is nearly legendary with the number of traffic accidents during a downpour soaring to up to four times their normal level. Don't try to stay in the rightmost lane. It has a nasty tendency to suddenly become an Exit Only lane, forcing last-minute lane changes. Instead, hold off until you get very close to your exit. If you're from outside California, don't be surprised to find motorcycles splitting lanes, driving between cars that are traveling in normal lanes. They can surprise you - and you have to keep an extra-sharp lookout for them when changing lanes in slow traffic. Other things that will help keep you moving: Don't try to get on the freeway during rush hour. Especially don't try to use I-405. Don't even try to drive toward it. Get where you're going off-hours and stay put until the traffic clears up. Or override your GPS to avoid freeways, which is often a faster option. Friday afternoons are reputed to be the worst for traffic jams, and trying to get into Los Angeles from other places on Sunday evening can also take much longer than you expected. If you don't have an interactive, GPS tune your car radio to KNX 1070 for traffic reports every 10 minutes on the fives. KFWB 980 also reports every 10 minutes on the ones. Even if you have GPS, an LA traffic report can be entertaining. When you first start listening you may think you've lost your ability to understand English as they cheerily rattle on about sigalerts on the Artesia Freeway and looky-loos adding to the trouble in the number two lane. If you want to sound like a local, call the highways “freeways.” If you're talking about a freeway by number, always put the word "the" before it. For example, Interstate Highway 5 is "the 5" and US Highway 101 is "the 101." Gore Point: That's the triangular area that separates a freeway from an exit ramp. It may or may not be paved, but is usually marked off with solid white lines. If the traffic report says a vehicle is in the "gore point," that's where to look for it. It is illegal to drive across a gore point; even you may see people do it. Angelenos love their freeways so much that they've given them nicknames and you may hear them used instead of highway numbers on the local traffic report. The LA Freeway map below is a handy tool that can help you quickly translate. And just for fun - in case you were wondering, according to California Highways, the SigAlert is named in honor of radio pioneer Loyd C. Sigmon. He came up with the idea of broadcasting traffic alerts to attract more listeners for radio station KMPC, which he co-owned. In the beginning, the alerts covered all kinds of emergencies - the first one broadcasted was about a train wreck. Nowadays, the Highway Patrol is in charge of issuing SigAlerts. Los Angeles has about 350 miles of HOV (high occupancy vehicle) lanes, also called carpool lanes. These lanes are reserved for vehicles with 2 or more occupants, 24 hours a day. And you can only get in and out of them in limited areas, which are well marked. FasTrak transponders work everywhere in California, so you can use your Bay Area FasTrak to access the toll roads and express lanes in SoCal. If you enter a lane that's marked for carpools and FasTrak - and have the minimum number of occupants in your car to qualify without paying - you will be charged unless shield it by putting in the silver-colored mylar bag it came in. In Orange County, drivers can pay to drive in the HOT (high occupancy toll) lanes on Highway 91, which are jokingly called "Lexus lanes." Oddly, locals call them "surface streets" as if other streets were either buried or elevated. They're often a less-aggravating way of getting around, but they have their quirks and local conventions. And you must know about making left turns before they scare the bejeezus out of you. The Metro Rail system is a good start at useful public transportation for Los Angeles, and you should check to see if it can take you where you want to go. It runs through downtown, Pasadena, Universal City, and Hollywood as well as many other places, for more information and schedules visit their website. In parts of the city, you may find a left turn lane at an intersection, but no protected left turn light. There's so much traffic that if you're too polite, you could sit there until you of starvation. Here's how to conquer the odd and frightening game of "chicken" that Angelenos face every day. Most of the LA's intersections are what is called “permissively” operated. That means you can turn left whenever gaps occur in opposing traffic. At busier intersections, that rarely happens. OK, it almost never happens. Here's what to do: Pull into the middle of the intersection as soon as the light turns green. Even if you're second or third in line, pull into the intersection anyway. Hang out, hoping for that magic gap in traffic. Turn if you can. When the gap hasn't appeared, and the light turns red, wait for all the cars coming straight on to get done running the light. When that's over, speed through your turn as fast as you can, with at least one — sometimes two — drivers on your tail. It sounds terrifying because it is, but Angelenos are so used to it that they seldom have accidents. You may get the idea that you also shouldn't try to jet into an intersection if going straight ahead as a light turns green — and you'd be right. Did you know that making three right turns yields the same result as turning left? Instead of paying attention to your GPS navigation, go one block past the intersection. Turn right at the first street you come to. Do that two more times or wait for your GPS to get you back on track and you'll be going the same direction you would have been if you made that left turn. Why Does LA Have Such Weird Left Turns? Why is it that Los Angeles city streets don't have left turn signals, even when they have left turn lanes? According to LAist, less than 20 percent of Los Angeles intersections have protected left turn lanes with a dedicated left turn signal. The LA Department of Transportation has nothing against left-hand-turn signals. In fact, the reason for the lack of signals is mostly historical. And these days it's also a matter of money. Installing a single left turn signal can cost $100,000 or more. In fact, according to the LA Times turning left on a red light is so much a part of the L.A. driving culture that traffic planners count on people doing it to keep traffic flowing. It sounds illegal, but it isn't quite. There's a section of the motor vehicle code that allows drivers to turn left on red as long as they move into the intersection while the light is green or yellow. That's why you sneak on out there behind that first car when you can. © Betsy Malloy Photography 2008. Used by Permission. This map is intended to show the major freeways in the Los Angeles area, and in particular to help visitors translate the common nicknames local people use for them, like when they say: "Take the Hollywood Freeway to the Santa Monica Freeway." It isn't detailed or accurate enough to use for navigation, but you can see a full-sized version of it at Google maps.